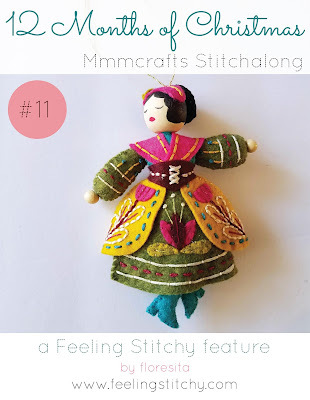 In 2018, using Larissa Holland's beautiful Twelve Days Ornaments Patterns, Floresita had the goal to stitch one pattern each month, and hopefully inspire you to stitch along with her. She finished her goal, not quite monthly (in December she had to cram in the last 3) after being diagnosed with breast cancer in May. She used this project to keep her head up and encourage her as she tackled 6 months of chemo which ended, as luck would have it, in December. She is grateful to everyone who tagged along for her journey, and she hopes her posts will encourage you to craft your own series of 12 Days ornaments!